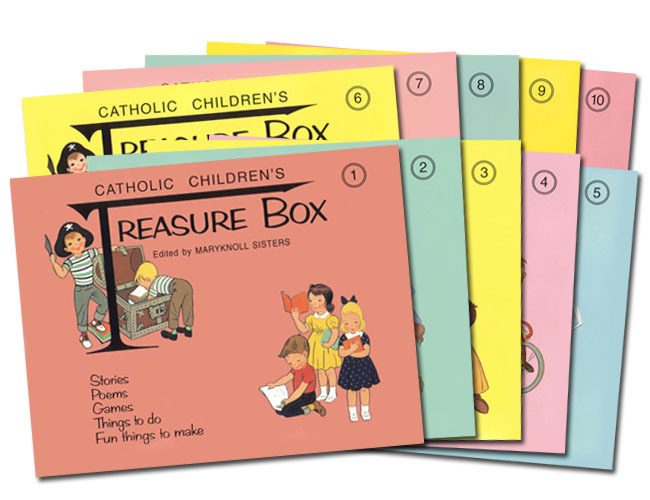 Activity workbooks which present a wonderful combination of fun, innocence, and the Catholic Faith. Filled with stories, poems, games, and crafts. Ten books in each series. Grades K-2. Full color illustrations. Imprimatur. 1957 Copyright. 10.5 x 8 inches. Soft Cover. Each 32 pp. I had these when they were new in the 50's. I loved them so much that I have saved them and have remembered lessons learned from them throughout my life. Perhaps they are why my faith has remained strong. I now teach a kindergarten faith formation class and I have selectively used some of the stories from them. They fit in well with our current program and the children love them! One little boy has said several times that he wishes I had more stories about St Therese.